Gaudi II (Gaudi Ver.2) is the improved version of Gaudi. Gaudi is an audio system I designed at age 17 in 1974, kept building for many, many years, and completed at last in 2015. It is a triamplified system using horn-loaded tweeters and squawkers. This system configuration is so good even today. As a matter of fact, I believe it is still ideal, because I can't find better solution. But the system design of Gaudi is too rough. And I have learned from my experience that it has some shortcomings. 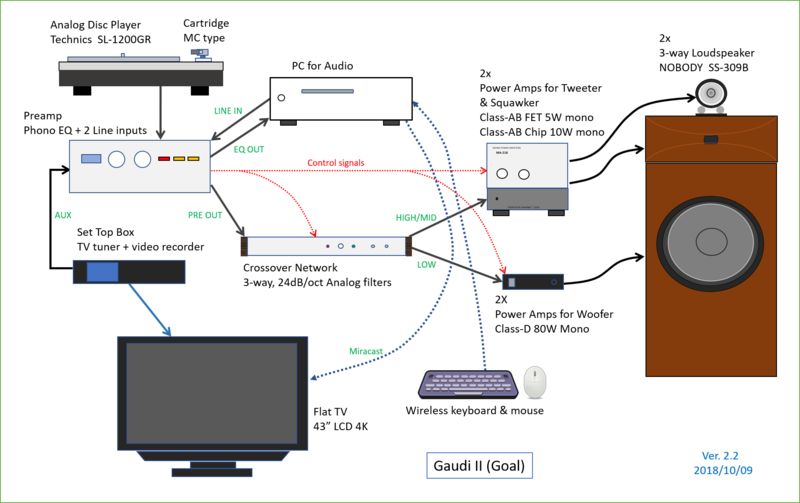 I am determined I should re-design it in more detailed way in order to establish my ideal audio system. Gaudi was named after the great architect, Antoni Gaudi (1852-1926). His masterpiece, Sagrada Familia, could not be completed before his death, and his successors have been building it thereafter. It is still under construction. I didn't expect I could complete my audio system by the end of my life. It's just like Sagrada Familia, isn't it? So I named my audio system Gaudi in 1999 (until then it had been nameless). Basically, the goal of Gaudi is 'hi-fi' (high fidelity). The term 'hi-fi' is almost dead language in Japan. So it may be better to call it 'Hi-Res' (high resolution). It's a more contemporary expression. It is rather difficult to define hi-fi. In the old website 'Tonochi's Audio Room', I defined two sorts of hi-fi; (1) physical hi-fi: reproducing sounds precisely analogous to signals contained in the source media, and (2) psychological hi-fi: reproducing sounds I feel just like a live performance to my ears. I didn't think the physical hi-fi always match the psychological hi-fi. There could be a psychological hi-fi system that is not physical hi-fi. I decided to pursue the latter one. Only the system configuration is shown here (see the figure). The input sources are vinyl disc (analog disc; AD), music files including hi-res, CD, DVD, Blu-ray disc and Internet radio. A CD player and an SACD player are not included in the system. An FM tuner is not included, either. The digital sources are played by PC. The main source is the AD. I was thinking I should quit using AD, since it's not easy to use. But it sounds better than the digital sources to my ears, so I've decided to use it as the main source, as in the Gaudi system. The sound quality of the AD is the top priority in the Gaudi II project. All the amplifiers are semiconductor type unlike Gaudi, where tube amplifiers were used. All the amplifiers except the woofer amp are those used in Gaudi. The woofer amp has changed from MA-201C to Flying Mall DAD-M100pro (two units). The speaker system (SS-309A) has not been improved to Rev.B yet. Tuning of the the room acoustics is still inadequate. In July 2017, Gaudi II started its history by changing a part of Gaudi. For details, please see the following page.